The TP-Link TL-WN722N Wireless N USB Adapter allows you to connect a desktop or notebook computer to a wireless network and access high-speed Internet connection. The TP-Link TL-WN722N Wireless N USB Adapter complies with IEEE 802.11n, and provides wireless speed up to 150Mbps, which is beneficial for the online gaming or even video streaming. Also, wireless security encryption could be established simply at a push of QSS (Quick Setup Security) button, preventing the network from outside threats. 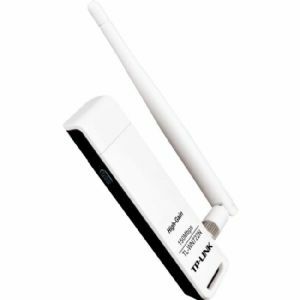 The TP-Link TL-WN722N Wireless N USB Adapter also offers a 4dBi high gain external antenna that can be rotated and adjusted in different directions to fit various operation environments, and can bring better performance than the internal antenna. 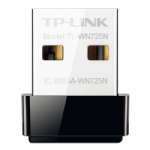 Purchase the TP-Link TL-WN722N Wireless N USB Adapter today! Wireless N -Speed & Range: Base on the IEEE 802.11n technology, TL-WN722N shows more excellent abilities of mitigating data loss over long distances and through obstacles in a small office or a large apartment, even in a steel-and-concrete building. Compared with legacy 54M products, TL-WN722N delivers performance enhancements, allowing you to have a more joyful surfing experience, including sharing files, watching streaming media. External Detachable High Gain Antenna: TL-WN722N offers 4dBi high gain external antenna that can be rotated and adjusted in different directions to fit various operation environments, and can bring better performance than the internal antenna. For even more demanding applications, the antenna can be replaced with diverse antennas to show even greater flexibility and wider wireless coverage. 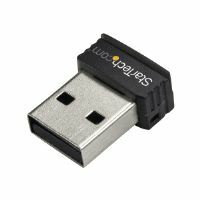 QSS Button - Quick Wireless Encryption: Compatible with WI-FI Protected Setup� (WPS), TL-WN722N features Quick Security Setup that allows users to almost instantly setup their security simply by pressing the "QSS" button automatically establishing a WPA2 secure connection, which is more security compared with WEP encryptions. Not only is this faster than normal security setups but more convenient in that you don't need to remember a password! WPA / WPA2 Encryptions - Advanced Security: As for the security of WI-FI connection, WEP encryption has been no longer the strongest and safest guards for outside intrusions. TL-WN722N provides WPA/WPA2 encryptions that are created by the WI-FI Alliance industry group, promoting interpretabilities and security for WLAN. 3.7" x 1.0" x 0.4"